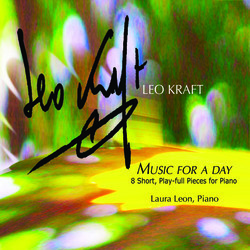 Music for a Day: 8 Play-full Pieces for Piano is an enchanting group of 8 very short, captivating contemporary pieces for solo piano-more in the guise of short poems-filled with wonderfully inviting sonorities, delightful twists and turns, heartfelt sensitivity and humor. Composed by Leo Kraft in 1982 for young pianists, this group stands as a wonderful, effervescent short group of pieces for all pianists, a gift to contemporary solo piano repertoire. I received a copy in 1982 from Leo, himself, and have been playing them every since. Taking them into a concert setting, I had the privilege of giving its premiere performance, as part of Composer's Voice September 28, 2014 concert at the Jan Hus Church in NYC. The titles are as inviting as the music, including an actual greeting-like “Good Morning," cleverly drizzling “Raindrops” atop an umbrella, and the gentle sweep of “Afternoon Breeze,” to “In Evening” invoking Copland’s cherished American sound and “Distant Bells" - a nod to Debussy’s impressionist “Cathedrale engloutie”, all expressive and engaging. Music For a Day is a truly engaging soundtrack for any given day.